There is a surprising amount of art surrounding you, if you are open to it. 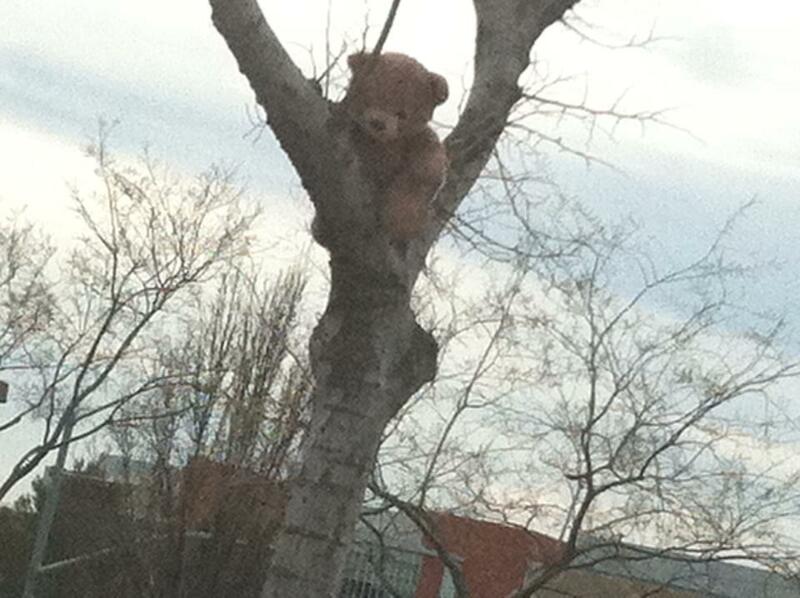 My husband and I were going out for sushi when I saw this bear in a tree in the parking lot. I have no idea whether he was casually tossed up there in a fit of anger (imagine a tantrum-throwing child hurling his teddy bear into a tree and the frustrated parent saying, “Well, fine… You want to throw Teddyface in a tree? I guess he LIVES IN THE TREE NOW!”), or as a joke, or in a sadistic act of revenge by an older sibling. Or maybe he was carefully posed in a moment of mid-suburban creative expression. What is the look on his face? Curiosity? Sadness? Loneliness? Teddy bears don’t usually have big smiles on their faces, unlike so many other children’s toys. Maybe a smiling bear seems vaguely threatening. In any case, this bear is currently gazing down into the asphalt jungle, as though hungry diners and eager shoppers are invading his forest homeland.